This is one of the rarest muscle cars ever made, a 1970 Mercury Cyclone Spoiler with optional 429 SCJ engine and factory Drag Pack. It's one of 341 equipped this way, verified via Marti Report. This is a largely original car, the proverbial survivor. It does run and drive but it is a 48 year old original drivetrain. Did have a recent tune up and carburetor rebuild and is running great! It was repainted once in its life and the body is in overall good condition. The interior is completely unrestored and the dash shows some nice patina leading us to believe it has never been removed or messed with. Originally a New Hampshire car, there is some rust on the underside of the hood and some on the undercarriage but overall the car is very clean, original and solid. Yes, that's right - 85,554 actual original miles stated on the title! If your are looking for an unrestored, rare muscle car that is unmolested look no further then this 1970 Mercury Cyclone Spoiler H/T! The Cyclone Spoiler was for the performance-minded with front and rear spoilers, black or white racing stripes that went from front to the rear of the car, an integrated functional hood scoop for ram air induction, 140 mph speedometer with a four-gauge suite including an 8,000 rpm tachometer with adjustable red line, vinyl bucket seats, dual racing mirrors and a competition suspension package. 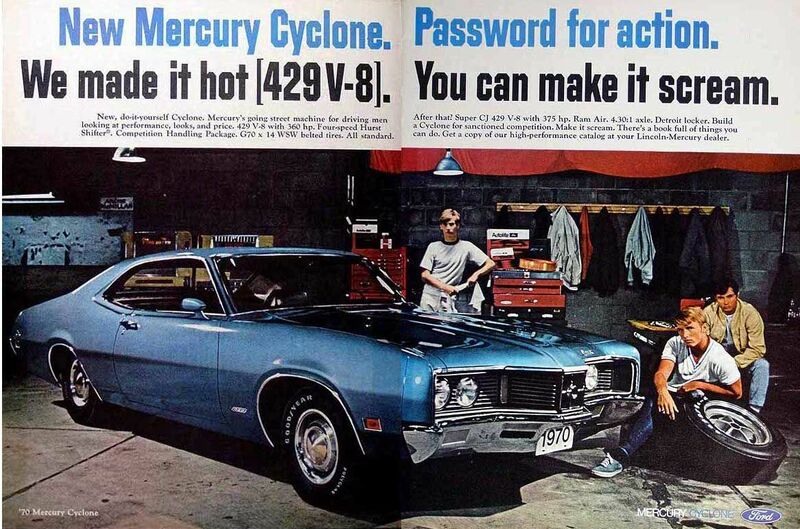 The 429 Cobra Jet with Ram Air was the standard engine for the Cyclone Spoiler, with the 429 Super Cobra Jet with Drag Pak and Super Drag Pak optional. The Super Cobra Jet upgraded the block to four main bolts and provided a solid flat-tappet camshaft, and the carburetor was changed from a 720 cfm Rochester QuadraJet to a 780 cfm Holley. Standard with the SCJ was the Drag Pack, this package added a front-mounted engine oil cooler and a 3.91 ratio gear, while the Super Drag Pack offered a 4.30 ratio gear and a Detroit "no spin" locker differential. 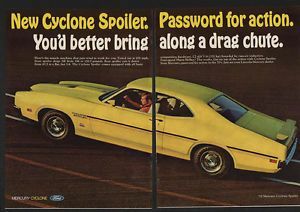 Colors for the Spoiler were limited to Competition Yellow, Competition Blue, pastel blue, Competition Gold, Competition Green and Competition Orange but for a premium Ford included the 'color of your dreams' program, and 31 buyers took advantage.